Hiya guys! It's hump day and we all know what that means. I mean besides the celebration of half the work week being gone, haha. It's time for Wedding Bliss! This is the weekly segment where I bring you nail art looks for the wild bride in all of us! This segment is part of the Preen.Me VIP program showcasing James Allen limited edition Nail Jewels, which are inspired by their most popular diamond rings! Nails fit for a rock star bride, am I right?! It's glam and sparkle meets edgy. This is yet another week where I feel that this look is very interchangeable if red is just a tad too wild. 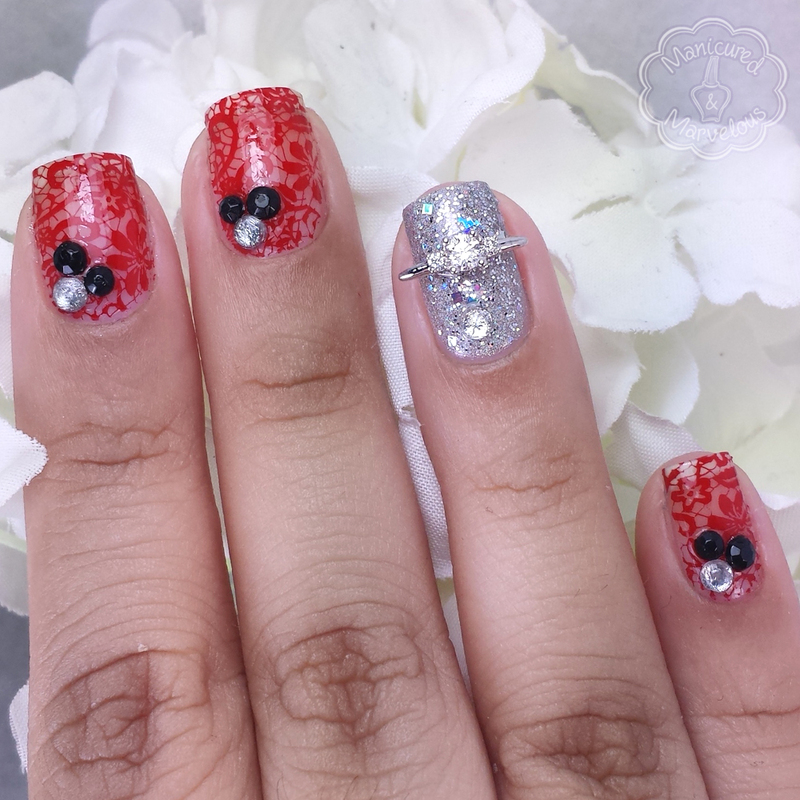 Of course, that accent nail cannot change, Unless it's to add more holo and/or sparkle! The best part about this mani? There is actually not much to it at all (hence no video tutorial) and you can have it done in about fifteen minutes. The important thing to remember when doing the stamping is neatness and having crisp lines. Since this is a 'lace' design the main focus will be on the lines themselves. I found myself re-doing a nail or two when I felt the lines were a little broken or wonky. Having a good stamping polish is key! Now on a bit of sad news, next week is the final week of my Wedding Bliss segment! It's definitely been a blast getting ideas for my own wedding day, hope you all have enjoyed it as well. The pressure is on though cause you know I have to go out with a bang! Stay tuned for the exciting conclusion of 'Rose's Crazy Wedding Nail Adventures'. Love the red stamping over the naked nail! And of course the blinged out acceent nail! I love that you show the non-traditional nails for a wedding! I love this look!!! I love the negative space stamping!! Gorgeous! I am following everyone else: that red-stamped nail is amazing. I *really* need to try it. I really like the lace stamped nails! I'm getting married soon and I have NO idea what to do for my nails! LOVEEEEE the intricate lace! It looks flawless! You did amazing! How cool! 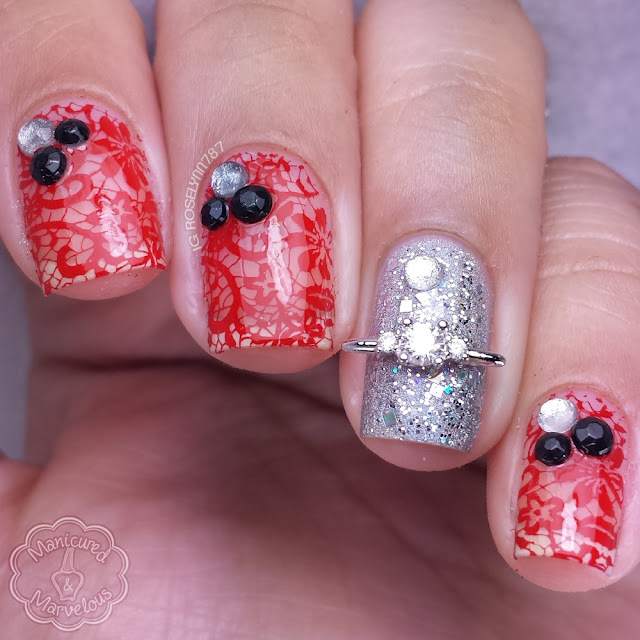 I love the idea of red stamping for a wedding manicure! I love the red lace. My wedding was red, black and white themed and these would have been perfect for my wedding. I love the entire look! Okay so I'm a perv and totally put together your hump day reference and wedded bliss xD Oh boy. Anywho, this is amazing!! I'm really loving all of the ideas that you've been coming up for these nail jewels! Really love the ring finger - no pun intended! I love the gems on the red nails! They're almost like little "bouquets"! The little bouquets were totally unintentional but now I cannot unsee them and I'm so pumped about it haha.